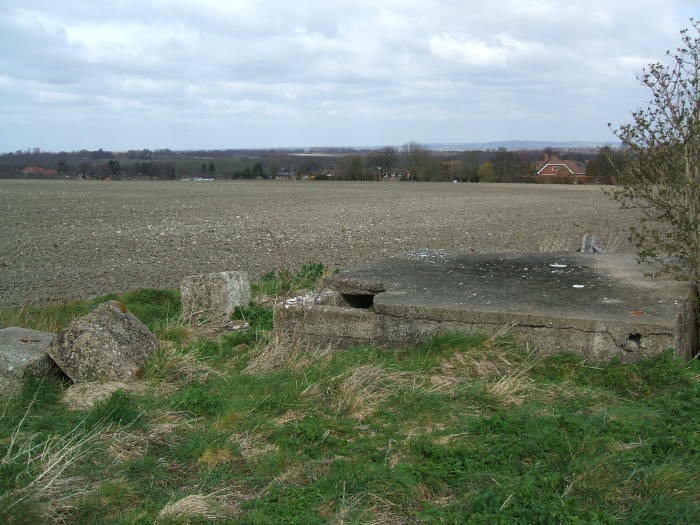 There was a glider base between the villages of Harwell and Chilton during World War II. It was used in the D-Day landings in Normandy, and in Operation Market Garden in the Netherlands. Let's see what we can see of the base today. 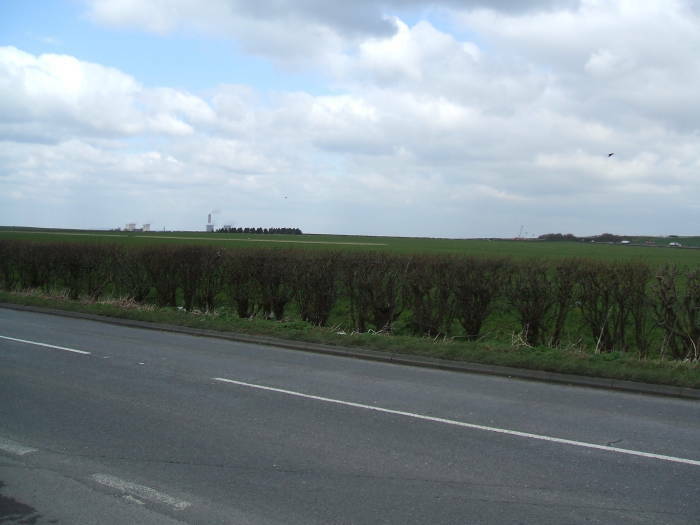 The glider base was near the large nearly flat field between Harwell and Chilton. See Harwell Field on the map below. 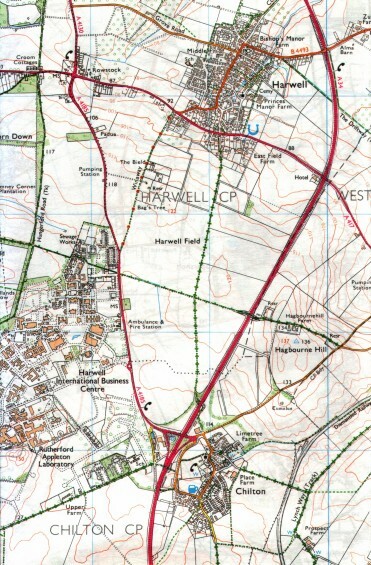 It's the large area surrounded by roads, with the two paths (dashed and crossed green lines on this Ordnance Survey map) crossing near its center. The main roughly level area of the field is about 1.5 by 1 kilometers. See the controlled airspace marked "EGR 102" on the map at top. That was there to protect a research facility of the U.K. Atomic Energy Commission, which just off one side of the former glider base. Harwell is just south-west of Didcot, south of Abingdon, which is south of Oxford. Buses run from Oxford to Harwell every 30-60 minutes. They're local buses, taking about 45 minutes in each direction. Buses number 32 and 33 connect from Oxford. A £6 pass lets you ride the area buses all day. The Tourist Information Centre in Oxford can provide all the details. South-west of the field are areas labeled on this map as "Harwell International Business Centre" and "Rutherford Appleton Laboratory". Also see the marked ambulance and fire station. The ambulance and fire station and some of the older buildings now in the business centre date from the World War II air base. The United Kingdom Atomic Energy Authority built a large research facility, the Rutherford Appleton Laboratory. The International Business Centre was a recent development, connecting the UKAEA with industry. 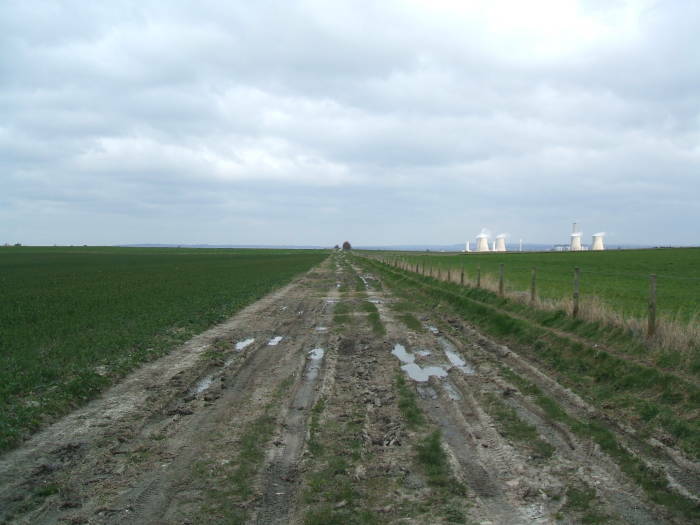 In these pictures we will walk south from Harwell, along the route marked with green cross as a public right-of-way. That will take us right across the area of the glider base. We will get lunch at the pub in Chilton, see what remains of the Rutherford Appleton Laboratory, and see what's become of the Harwell International Business Centre. Then we will return by the road along the business centre and the other path marked "Walkway" on here. 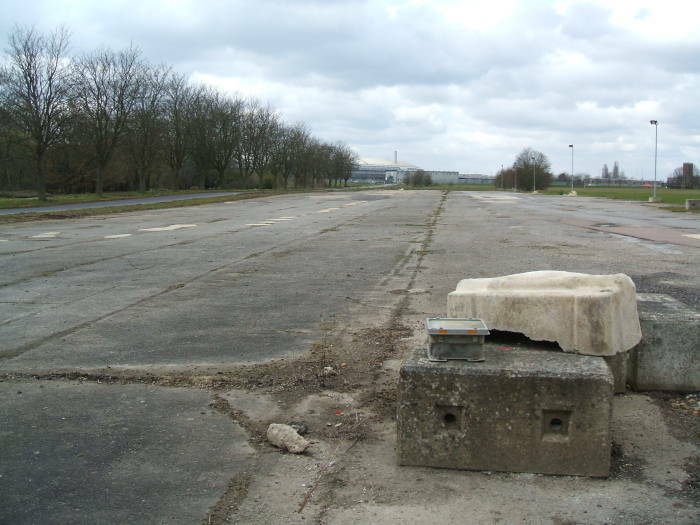 An old concrete structure remains near the north end of Harwell Field. I don't know if this really dates back to the area's military use during the war. It might instead have been a water tank for livestock or had some other agricultural use. We're looking south from the north end of Harwell Field. We have just come up the hill from the town of Harwell, and we're at one end of the high flat area. 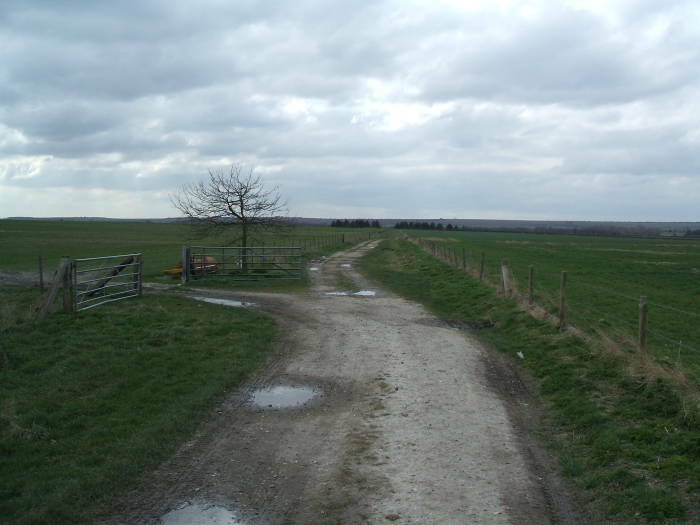 Two footpaths cross near the middle of the field. The path running from north to south continues straight ahead of us. The crossing path follows the lane branching off to our left. The line of evergreen trees in the distance at center mark the far end of the field. Chilton is down a slope beyond them. Turning around at the path crossing and looking back north, we see the Didcot power station in the distance. 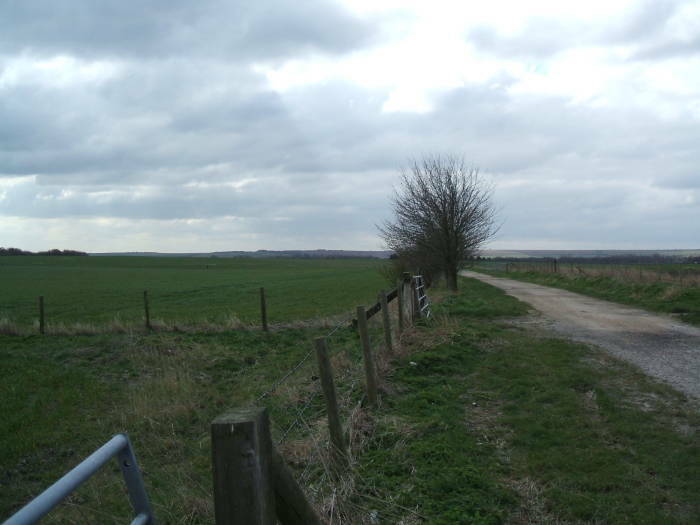 The town of Harwell is not visible, as it lies below the flat open area of Harwell Field. We have now reached the south end of Harwell Field. 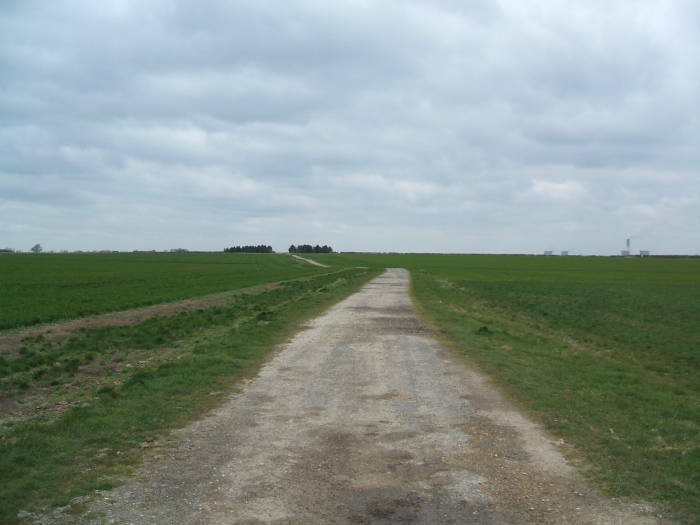 The clump of trees on the horizon mark the path crossing near the center of the field. 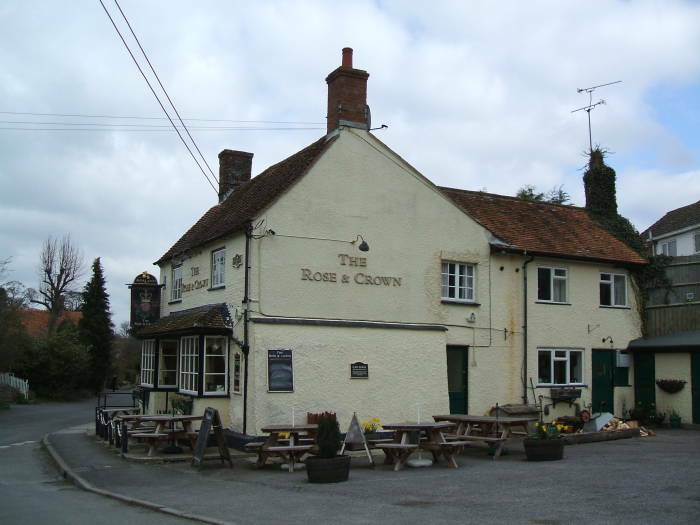 The Rose & Crown pub in Chilton provides a nice place to get lunch and rest for a bit. 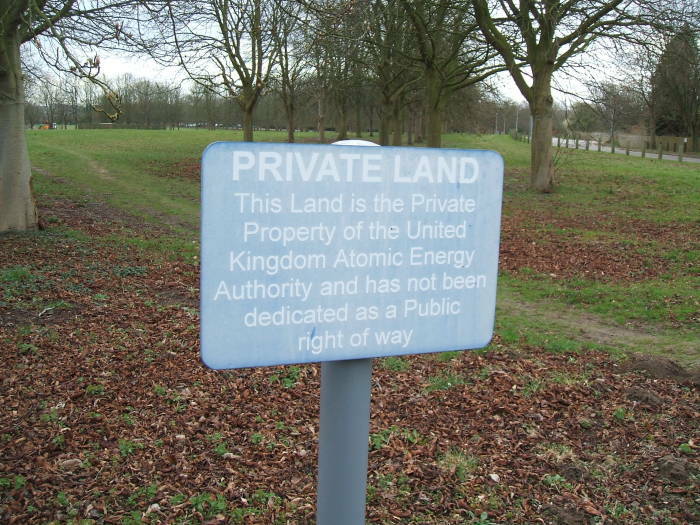 Returning north along the A4105 road, we see this sign at the edge of the Rutherford Appleton Laboratory. The RAF headquarters building, barracks blocks, hangers, and so on becaume the United Kingdom Atomic Energy Research Establishment or UKAERE. The UKAERE has been closed and the site is no longer known as the Harwell International Business Centre, it is Harwell Oxford. The facilities now house a wide variety of companies, not limited to nuclear and space physics as in the past. Most of the site is now open for public access, although two areas are still fenced off and patrolled by the Nuclear Constabulary as it is a commercial nuclear decommissioning facility. Much of the site is scheduled to become a business and science complex, but the old and sometimes conflicting signs still abound. 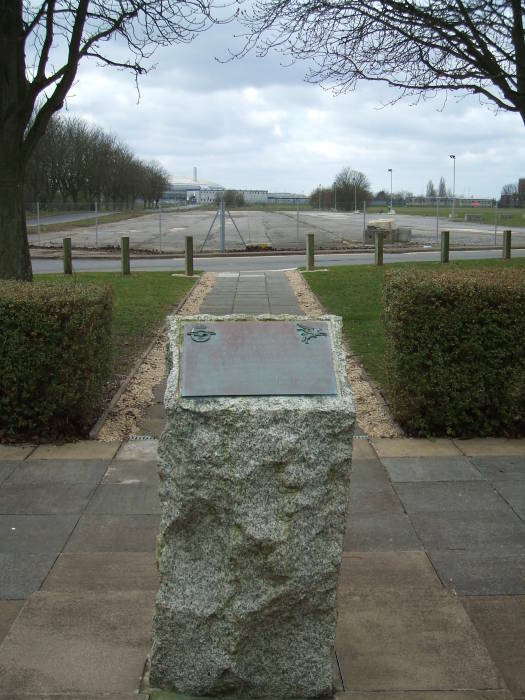 This commemorative marker is near the public phone call box shown on the map near the south end of Harwell Field. We are looking toward the large and exotic looking Rutherford Appleton Laboratory building. If you're using GPS, it's around SU 483 863. "This stone marks the end of the runway from which aircraft of No. 38 Group, Royal Air Force, took off on the night of 5th June 1944 with troops of the 6th Airborne Division who were the first British soldiers to land in Normandy in the main assault for the liberation of Europe." The old runway surface is visible, running to the south-west off the south end of Harwell Field toward the present laboratory building. If you look on Google Earth, you can find the three runways. The end of one is marked now as Seven Road, it runs to the south of the large round "donut" building. The second is to the east, marked "Frome Road"
The third is what is now Fermi Avenue, serving as the main access road to the southwest area of the site. We have turned to look back across Harwell Field from that marker. The remaining runway surface is behind us.